Segmented Negative-stranded RNA linear genome, L segment is about 8.8kb, M segment about 4.8kb and S segment about 3kb. Transcription starts by viral RNA dependent RNA polymerase (L) binding to a promoter on each encapsidated segment, and is terminated by a strong hairpin sequence at the end of each gene. mRNAs are capped by L protein during synthesis using cap snatching , but are not polyadenylated. S and M segments uses ambisense strategy to encode forsevral proteins: both genomic ans antigenomic RNA are transcribed. The hairpin sequence is a stop polymerase signal which prevents ambisense transcription from producing dsRNA. MRNA1 encodes for a polyprotein which is cleaved by host protease into Gn and Gc proteins. Virus penetrates into the cell by effraction or plasmodesmata transport. 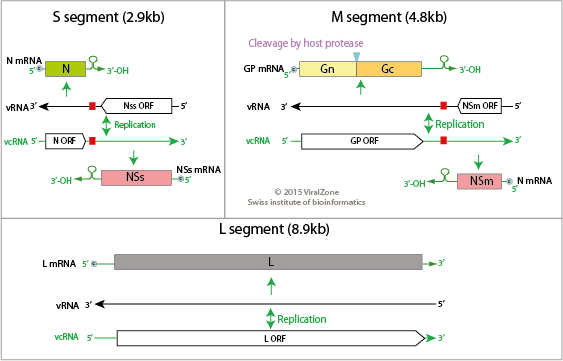 Cytoplasmic transcription by viral polymerase on the RNA viral RNA template. Alternatively budding of particles occurs at the cell membrane, releasing new virions. 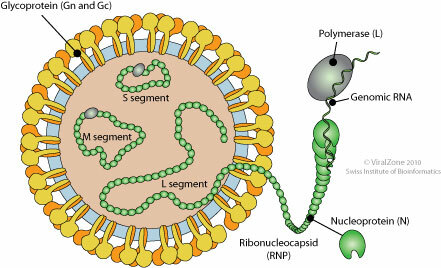 Attachment of the viral G glycoproteins to host receptors. Budding of particles occurs at the cell membrane, releasing new virions. TSWV NSs inhibits Dicer-mediated dsRNA processing thereby inhibiting RNAi-mediated immunity to control innate immune signaling.